VW Golf GTI used by the Hawks police unit (file photo). 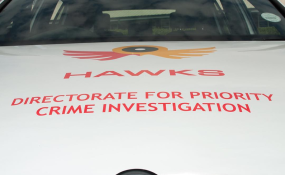 A Hawks investigation could reveal whether officials, including those from the City of Cape Town, have been working with gangsters and assisting them in various activities including drug trafficking.News24 this week asked the Hawks if they were investigating any city officials for possibly being involved in drug dealing or trafficking. Western Cape Hawks spokesperson Captain Lloyd Ramovha did not confirm or deny any specific investigations into this and responded with: "Owing to ongoing investigations we are not at liberty to divulge the details of those subjected to same, lest we jeopardise our case." Last Tuesday City of Cape Town law enforcement officer Clinton Langeveldt was arrested in Bellville South. At the time Ramovha said that during a search operation 41 000 mandrax tablets, worth just less than R2m, were discovered hidden in a vehicle. Langeveldt faced charges relating to drug possession and dealing. He is expected back in the Bellville Magistrate's Court on Wednesday. Several sources told News24 the mandrax found by the Hawks belonged to a high-profile suspected gang boss.These sources said it was suspected that vehicles, for example, City of Cape Town ones, were used in transporting drugs for gangsters as these vehicles were less likely to be searched. When these suspicions were put to Ramovha, he replied: "We are confident ongoing investigations will assist us in uncovering the links thereof." He urged anyone with information on the matter to contact the Hawks. The City of Cape Town's safety and security executive director Richard Bosman this week said no drugs were found in city vehicles when the arrest was made in Bellville South last week. He initially referred all other News24 queries to police. But Bosman later replied to News24's questions. Asked if members of the city's safety and security internal investigations unit were investigating any city officials for possible drug dealing, Bosman said that only the official arrested last week was under investigation. "All our vehicles have trackers that are randomly checked for deviations," Bosman said. "We will continue using the current system; however, we will institute more frequent checks on vehicles and staff, especially on night shifts." Bosman said the best deterrent in fighting crime internally was when residents reported irregularities when spotting these. "All staff are assigned to supervisors who are required to exercise control over the staff in terms of their duties, quality of work and areas of patrol," he said. A source who claimed to have knowledge about corruption within the Hawks also named a warrant officer as selling vehicles on behalf of a suspected gang boss. News24 has also seen a document, dated last year and apparently stamped at a police station, claiming the same. "There are internal systems in place whereby members disclose their financial interests annually and added to this there is a transparent vetting process in place which is overseen by our integrity section, additionally random polygraph tests are done from time to time," Ramovha said. "None of our members are involved in gangsterism, except to fight the commodities that characterises it, this is done through multifaceted project-driven investigations to stop the proliferation of illegal firearms and drugs."